Paul McGinley survived the shock of seeing a lady marshall break her leg in a fall to open with a four under par 68 in the BMW International Open in Munich. "I heard her slipping and then she screamed," said the Dubliner. "The bone came out - it was horrible. "My worry was that it was her back that was cracked, but hopefully she'll be all right." Rory McIlroy is seven behind Goosen. Tied 15th in Wales two weeks ago in his first event since parting with his caddie Darren Reynolds (he's now got Pete 'The Pro' on the bag), 42-year old McGinley needs a decent run of results as he sits 124th in the Race to Dubai with just one top ten finish this season. "It's a good start, but there's a long way to go," he said. South Africa's Refief Goosen had eight birdies in a a 64 to lead by two from 2008 Irish Open champion Richard Finch with McGinley tied 12th and Peter Lawrie a shot further back after a 69. Michael Hoey had a 70 but pre-tournament favourite Rory McIlroy had to settle for a 71 that left him tied with Damien McGrane, Gareth Maybin and Gary Murphy. The 20 year old bogeyed the last and was outscored by playing partner Bernhard Langer, who turns 52 in August. The two-time Masters champion matched McGinley's 68 but it was another testing day for Irish Open winner Shane Lowry as he posted a two over par 74 to share 112th spot with the likes of John Daly. Yet to make the cut in two starts since turning professional, the Clara man could need a three under par second round if he is to earn his first cheque in the paid ranks. It was also a disappointing day for the rest of the Irish on the European Seniors and Challenge Tours with none of the green army managing to match or break par. Fresh from his disqualification for missing his tee time in St Omer last week, Jonny Caldwell had a one over 72 to tied with Colm Moriarty and Simon Thornton in The Princess at Båstad GK in Sweden. Noel Fox and Gareth Shaw shot 75 and Michael McGeady a 76. Paul McGinley was the big Irish winner as Italian stallion Francesco Molinari galloped to a course record 63 to grab the first round lead in The 3 Irish Open at soggy Baltray. 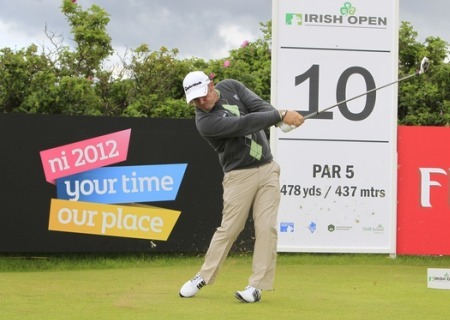 The big question these days appears to be: What’s wrong with Padraig Harrington? But what about Paul McGinley, who turned a promising (possibly tournament winning) start in the BMW International Open into his fifth missed cut of the European Tour season. Now 42, McGinley has shown few sparkles of brilliance over the past two years and is ranked 188th in the world behind every other Irish tour player bar Gary Murphy (431st) and rookie Jonny Caldwell (1,093rd). It would appear that his lack of driving accuracy is killing him, as we explain later. It's nearly four years since McGinley last won. Shane Lowry is 168th in the world thanks to his shock Irish Open win as an amateur just over a month ago but he’s still waiting to earn his first euro with his clubs after missing the cut for the third time in a row. Paul McGinley was keen to rest after his opening 69 at Royal Portrush. Picture Fran Caffrey www.newsfile.iePaul McGinley was keen to hit the pillow after he “fell asleep” and bogeyed the last for a three under 69 in the Irish Open.